An original letter of correspondence between brothers and business partners Joshua Coffin Chase and Sydney Octavius Chase. Topics discussed in the letter include Mr. Cartright's purchase of nursery trees from Isleworth Grove. Original letter from Joshua Chase to brother Sydney Chase, March 29, 1934: box 49, folder 20.84, Chase Collection (MS 14), Special and Area Studies Collections, George A. Smathers Libraries, University of Florida, Gainesville, Florida. 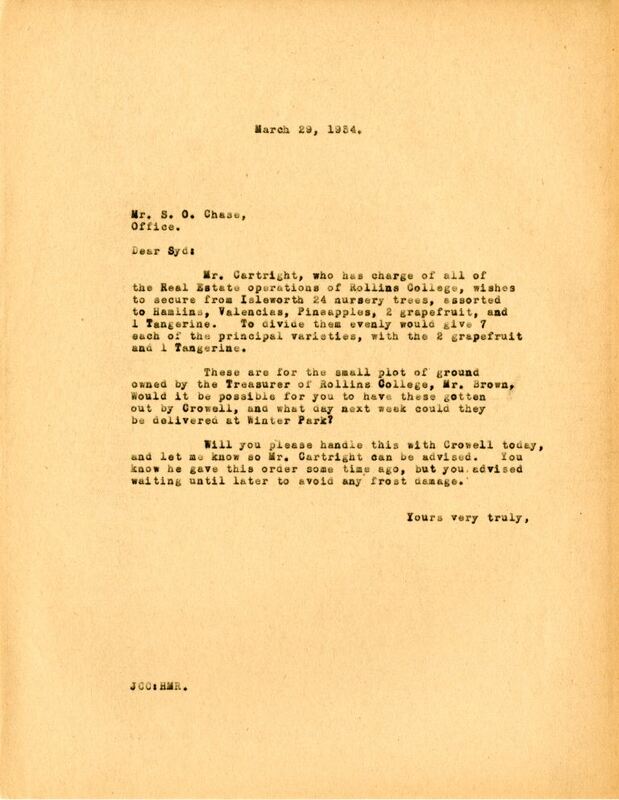 Digital reproduction of original letter from Joshua Chase to brother Sydney Chase, March 29, 1934. Mr. Cartright, who has charge of all of the Real Estate operations of Rollins College, wishes to secure from Isleworth 24 nursery trees, assorted to Hamlins, Valencias, Pineapples, 2 grapefruit, and 1 Tangerine. To divide them evenly would give 7 each of the principal varieties, with the 2 grapefruit and 1 Tangerine. There are for the small plot of ground owned by the Treasurer of Rollins College, Mr. Brown. Would it be possible for you to have these gotten out by Crowell, and what day next week could they be delivered at Winter Park? Will you please handle this with Crowell today, and let me know so Mr. Cartright can be advised. You know he gave this order some time ago, but you advised waiting until later to avoid any frost damage. Chase, Joshua Coffin. 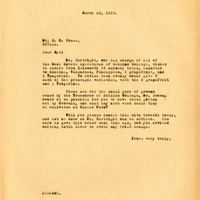 “Letter from Joshua Chase to brother Sydney Chase (March 29, 1934).” RICHES of Central Florida accessed April 22, 2019, https://richesmi.cah.ucf.edu/omeka/items/show/2728.